Properties in Howey-in-the-Hills average 4.5 out of 5 stars. Property 4: NEW! Gated Guesthouse at Historic Howey Mansion! Property 5: Sunrise to Sunset on private 900 sq ft dock with BBQ! Wow $100/nt May Special, Book Now! Watch Poolside TV! Balcony Views! Disney close by! Property 9: Wow $100/nt May Special, Book Now! Watch Poolside TV! Balcony Views! Disney close by! 'Cozy Nook Villa' w/Pool & Lanai -20Min to Disney! Property 17: 'Cozy Nook Villa' w/Pool & Lanai -20Min to Disney! Regal Palms Resort -4BR Close to Pool/Lazy River FREE WIFI ~~Near Disney! Property 18: Regal Palms Resort -4BR Close to Pool/Lazy River FREE WIFI ~~Near Disney! Wow $100/nt May Special, Book Now! 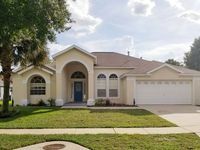 Professionally Decorated, Close to Disney World! Property 23: Wow $100/nt May Special, Book Now! Professionally Decorated, Close to Disney World! Property 27: Villa with Private Pool and spa. Regal Palms – Lazy River – Water Slide – Disney - Free Wifi - Baby Crib + FUN! Property 30: Regal Palms – Lazy River – Water Slide – Disney - Free Wifi - Baby Crib + FUN! SUMMER RATE SPECIAL! DISNEY AREA 4 Corners vacation home wPOOL, & BILLIARD ROOM! Property 44: SUMMER RATE SPECIAL! DISNEY AREA 4 Corners vacation home wPOOL, & BILLIARD ROOM! ANTIGUA Lake Front Villa !!! Available Dates after Mid May ! ! ! Property 46: ANTIGUA Lake Front Villa !!! Available Dates after Mid May ! ! ! Davenport Resort Townhome w/Pool - Mins to Disney! Property 47: Davenport Resort Townhome w/Pool - Mins to Disney! Perfect! 3 Bed 3 Bath Family Townhouse At Regal Palms-Disney/Universal/Golf! Property 49: Perfect! 3 Bed 3 Bath Family Townhouse At Regal Palms-Disney/Universal/Golf! We rented this beautiful home to attend a family wedding. It was absolutely beautiful and very relaxing!